Two generations ago, "two Americas" referred to the sharp divide between prospering Americans and those mired in poverty, stagnation and prejudice, a gulf addressed by Michael Harrington in his influential book, The Other America: Poverty in the United States. With the advent of social programs such as Medicare, Medicaid, food stamps and housing subsidies, much of the grinding rural and urban poverty described in the book has been alleviated. But the gap between the super-rich, the wealthy and "the rest of us" has widened, forming what is in essence two Americas -- the top 5% and the bottom 95%. And this is creating a situation where economic growth, as measured by GDP, may increasingly mean that 95% of Americans are still not doing better financially. Read on to find out why. The income gap is widening. David Stockman, director of the Office of Management and Budget under President Ronald Reagan, recently noted in an editorial that the top 1% of Americans received two-thirds of the gain in national income from 2002 to 2006. The number of people in the highest reaches of income also fell. Tax returns reporting income of $1 million or more fell by 22% to 321,294, and the number of returns that reported income of more than $10 million fell 36% to 13,480. Put the data together, and this reveals an increasing concentration of income and wealth at the top -- and this small group increasingly dominates the U.S. economy. According to Moody's Analytics research, the top 5% of Americans by income are responsible for 37% of all consumer spending -- about the same as the entire bottom 80% by income (39.5% of consumer outlays). This trend has led to the coining of a new word, plutonomy -- an economy that's dependent on the spending and investing of the wealthiest slice of citizenry for growth. As a result, when the top 5% in income -- those households earning $210,000 or more annually -- rein in their discretionary spending, the U.S. economy suffers disproportionately. Indeed, the economy's slump this summer can be tracked directly to a decline in the discretionary spending of the wealthiest Americans. Furthermore, the very rich are pulling away from the merely wealthy. 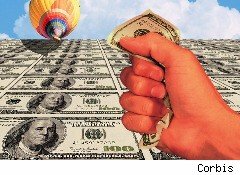 Those earning $10 million or more per year are increasingly wealthier than the 321,000 earning $1 million or more, and those top earners are pulling away from the rest of the top 5% of households by income. In the housing and stock market boom years of 2002 and 2007, the incomes of the bottom 99% of households by earnings grew by a meager 1.3% a year in inflation-adjusted terms, while the pockets of the top 1% grew 10% a year. Over the past 25 years since 1985, the top 1%'s share of national income has doubled -- in 2007, it netted 23% of the nation's total income. The income of the wealthiest Americans -- the top 0.1% -- has tripled in that 25 year period. This wafer-thin slice of Americans now earn as much as the bottom 120 million wage earners. "Our problem," Greenspan said, "is that we have a very distorted economy in the sense that there has been a significant recovery in a limited area of the economy amongst high-income individuals who have just had $800 billion added to their 401(k)s and are spending it. Large banks and large corporations, as everyone's pointing out, are in excellent shape." "The rest of the economy, small business, small banks, and a very significant amount of the labor force, which is in tragic long-term unemployment, that is pulling the economy apart," noted Greenspan. "The average of those two is what we are looking at, but they are fundamentally two separate types of economy." This great divide between the spending and income of the wealthiest 5% and the rest of us (95%) calls into question the value of GDP (gross domestic product) as a meaningful statistic. If the wealthiest Americans are buying luxury cars and apparel again, that may pump up the nation's GDP, but it doesn't mean 95% of the populace are doing better financially.